Ever wondered where something like “Bug of the Week” might lead? Sure it is fun, but can anything really useful come out of checking the insects in your back yard once a week? It turns out some very cool things can result from regular bug watching. 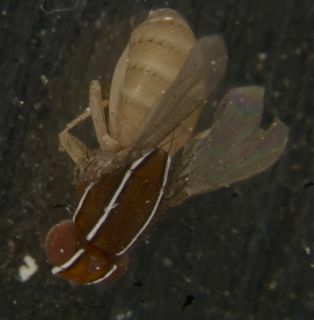 A few weeks ago when I was looking at the fruit flies in my yard, I found something I didn’t recognize. I sent it to a friend of mine at the University of Arizona to identify. When I looked through my camera lens I saw this fruit fly with incredible white stripes that almost glow florescent, they are so bright. 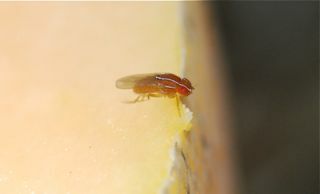 My friend identified it as Zaprionus indianus, a fruit fly native to Africa, the Middle East, southern Europe and southern Asia. This species was first found in the Americas in 1998 when it was reported from São Paulo, Brazil. It just arrived in Arizona within the last year or so. I call it “Z” because of the genus name and its fancy zebra stripes. I’ll be keeping a good eye on Z to find out what it likes to eat and how many are around. 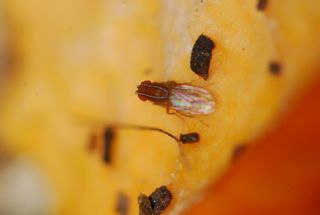 Right now it hangs out with the other fruit flies in the compost heap. You never know when you might meet some new insect neighbors, if you just go out and look.